1 | GAP is coming out with some of my favorite pants as of late. These fit great, come in multiple styles and are on sale for $39.99 (plus GAP is running an additional 20% off your online purchase today!) I could wear these in every color! 3 | Ann Taylor has these darling flats on sale for $59.99 (plus an additional 30% off everything online through today!). I bought a pair and they are super comfortable. 4 | J. Crew Factory has this great gold link bracelet, very similar to the one offered in J. Crew, for only $34.50. What a great price for a great staple. 5 | J. Crew Factory does it again with this great chambray shirt. I think this belongs in every woman’s closet and with a price tag of $59.50, you can’t beat it. Another great deal today: LOFT is having a big flash sale! I love that necklace, so simple and chic. I did steps 1-3 and the two additional steps. 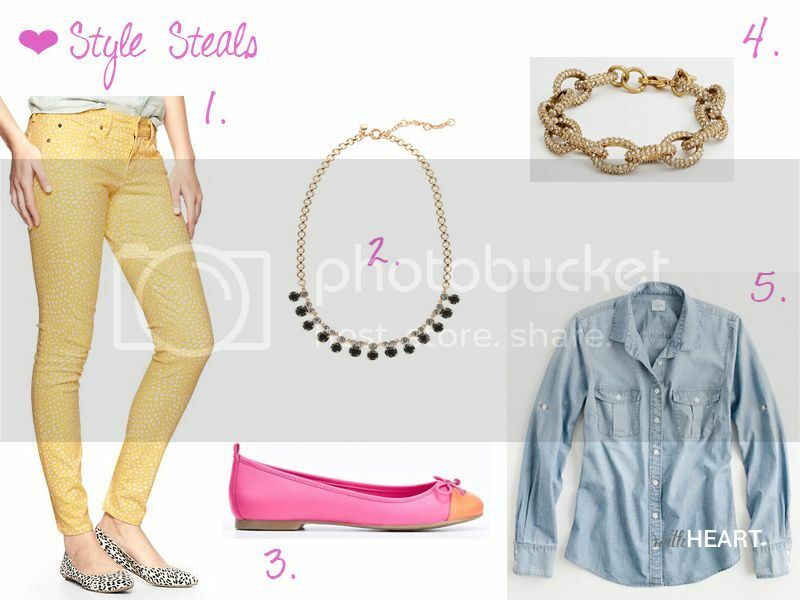 I love those flats and the pretty necklace! Congrats to Ashley.